The anthracite Stresemann finish that is soon to grace the M405 line will be made from cellulose acetate. The cap, section, and piston knob will be done in black resin. The M405 if 4.92 inches long and weighs 15.3 grams with an ink capacity of 1.30mL. The furniture is palladium plated as is customary of the x05 lines. Trim will include two rings at the piston knob and one on the section. The cap will have two cap bands and the cap top will be palladium plated with a single chick logo. The nib is a monotone, rhodium plated 14C-585 in sizes EF, F, M, and B. This finish will also be available in rollerball and ballpoint variants. Pricing will vary by vendor and currently ranges from €256-310 (~$281-341) from overseas vendors. US pricing is not yet clear but will probably range somewhere between $380-400. Those purchasing from outside of the European union can score some savings with prices of $280-300 when the VAT is subtracted. The M405 release is slated for mid-November. I like the looks of the M405 because I love my M805. I will personally pass on this one since I already have the larger model. I’m sure many will welcome this finish in a smaller size and I recommend it to anyone that was turned away by a pen with the heft of the M805. That said, I can already hear the disgruntled voices of those that would have loved to have seen this finish in an M6xx sized model. While there is no news on that, I wouldn’t rule it out as a possibility in the future. Well, that’s very interesting news. I’m glad it’s a M405, so I will not “need” it. That doesn’t mean that the wallet will get any break, since my wife is all over it 🙂 — and rightfully so, the Stresemann is very classy and I love mine. Luiz, when you refer to the Stresemann, which color are you referring to, green, blue, or charcoal, since they all are patterned based on Gustav Stresemann? I was referring to the Anthracite (above), as has been the practice. Although I understand that, technically, all of them are “Stresemann”. And it is, indeed, a shame that they stopped producing the red one in the M800 size, I’d love to get one of those. Since Gustav is credited with the pattern on Pelikan’s classic green and black pensk long before there was a charcoal version, why you many folks, you included, refer to the charcoal pen as “the Stresemann”. All three colors, green, blue, and charcoal, are Stresemann design pens. Why does the incorrect terminology persist? And while we are at it, let’s all mourn the red Stresemann. The Stresemann term here is not incorrect because that is Pelikan’s own declaration since the release of the M805. I agree that the striped pattern has always been unofficially referred to as Stresemann, no matter the color. When Pelikan realeased the anthracite, they wanted to specifically honor the tradition and so the anthracite models are officially called Stresemann. Pelikan’s own literature states; “Both the suits and the pens still carry that name to this day. 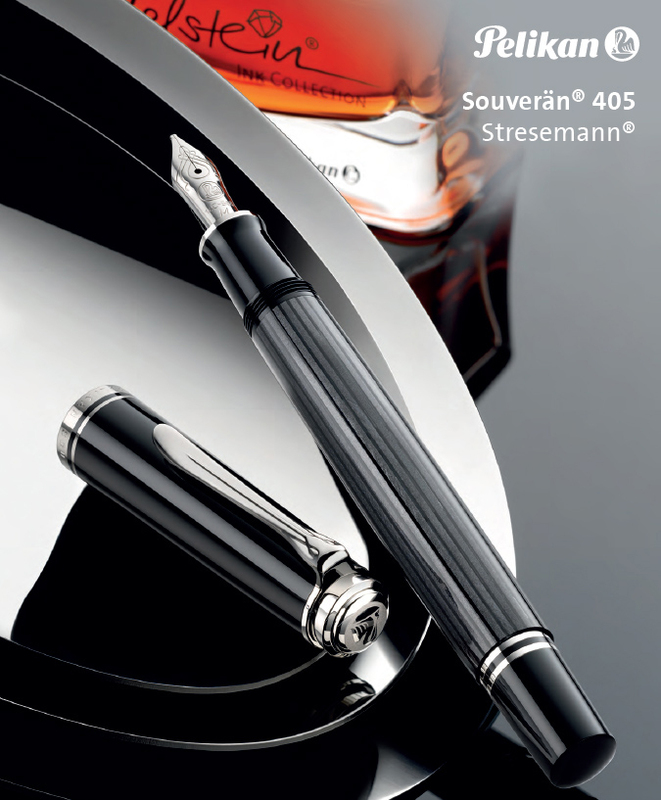 To officially acknowledge and honor this legend, Pelikan has now named the latest addition to the standard collection, the Souverän with elegant stripes in anthracite, the ‘Stresemann. '” So it’s actually not incorrect but rather the model’s official designation. I suppose anthracite was given the honor since the color most closely resembles that of a suit. Hope that clears up any confusion. I love it, always have and was one that wished it was on a smaller pen. My only barrier to not getting one of these is the budget. I am glad they have introduced it to the M4xx line. Perhaps I will be able to afford one in the secondary market down the road, or my budgetary limitations will change. I hope that your budget will come to allow you to pick one of these up in the future. Good luck! I’m afraid I’ve got small hands so the M2xx/4xx is the perfect size for me and mine is already ordered and paid for. Pelikan have really hammered me this last few months with the M205 Aquamarine, M400 Brown Tortoiseshell and the M205 Blue Marbled !! I really hope they leave me be now until next year. The last two years have been chock full of great releases. Good for soul but bad for the wallet. Sounds like your gathering a very nice flock there. Enjoy the M405! I am puzzled by the name given this new/old pen, Stresemann. What does it mean?? Incidentally the pen is nothing to rush to the store to buy. Where does the Stresemann moniker come from? Gustav Stresemann (1879-1929) was the foreign minister of the Weimar Republic who was awarded the Nobel Prize for Peace in 1926 for his reconciliatory efforts after World War I. His other claim to fame was the invention of a new kind of suit that blended a formal appearance with extra comfort. Due to his proclivity for wearing suits with thin stripes, people started drawing parallels with Pelikan’s now well-known striped pattern. All of Pelikan’s striped models were unofficially called Stresemann. With the release of the M805 anthracite, Pelikan chose to honor that tradition and to pay homage to Gustav by officially naming that colored model the Stresemann. Hope that helps. i’m so getting one of these. though i much prefer the 605 size, i like the grey finish too much to pass on this. i had wanted one when it first came out in 805 size, too bad it’s too large and heavy for my liking. this 405 is a great substitute. It should make a great addition to the flock. The anthracite pattern is beautiful in a very simple and elegant way.